It’s one of the most beautiful train journeys in Europe. Two and half hours from Porto on the train from the majestic Sao Bento train station (with a change at Campana), the train trundles past largely residential scenes for the first 90 minutes, but then, if you sit on the right side, the views are the kind that causes jaws to drop and cameras to click. 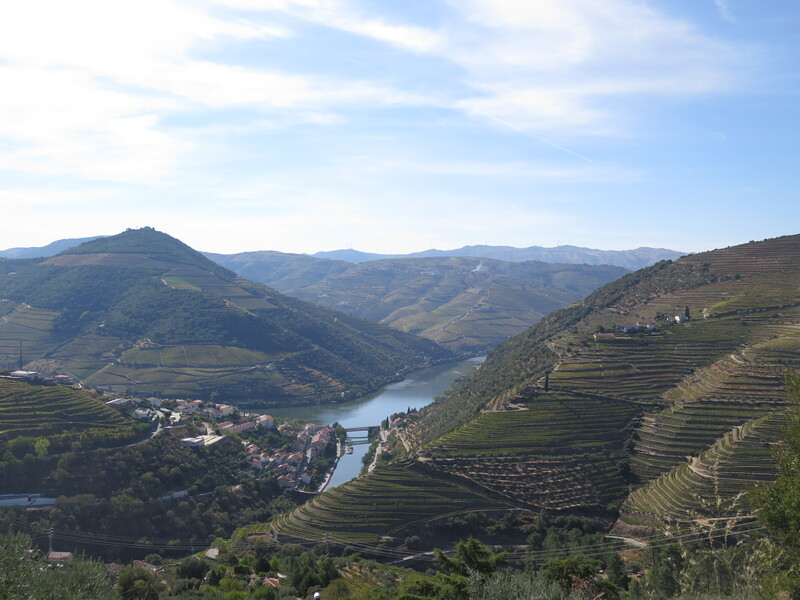 The winding Douro river is spectacular enough, dotted with the occasional luxury cruise boat gleaming in the sun; but it’s the wonderful terraced vineyards, the grand old quintas, the little stone -brick villages that climb up the banks, that make this a truly magical ride. 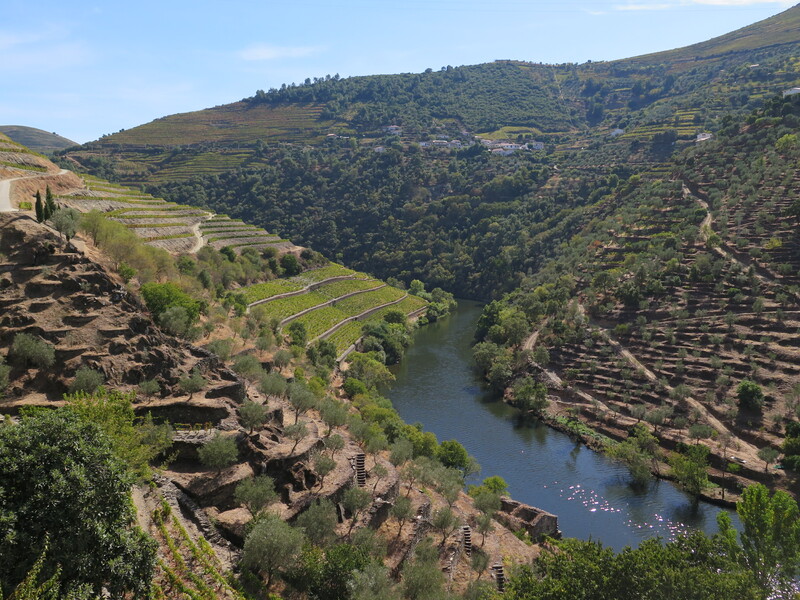 The Alto Douro is home to the oldest demarcated vineyards in the world, dating back over 2000 years, and has been a Unesco World Heritage site since 2001. It’s a region with a Mediterranean climate, marked by hot, dry summers and cold winters. It was mid-Oct when we visited for a night, and though we’d missed the grape harvest by a couple of weeks, the weather was still lovely and we were able to get a real taste for this beautiful part of Portugal, and a taste of the fabulous wines and ports that are produced in this region too of course. The train came into Pinhao town, a lovely little place of cobbled streets and colourful narrow houses, situated in a perfect location at a wide bend in the river and encircled by terraced hillsides that produce the world’s best port – a bustling little town with a touristy vibe. The train station is small but beautiful, with azulejos depicting the grape harvest, and just outside taxis wait to take you to a quinta or two. We had a night booked in an area called Provesende. We got a taxi and climbed up and up and round and round into the hills, and after around 30 minutes we came into the charming little village of Provesende (population around 300), quiet, rural, and around the town square an old Baroque church dating from 1720, a baroque fountain which is not much younger, an even older tavern (cafe Arado) that seems to be the place for the village drunks (many of them seemingly still floating on the velvety bed of the grape harvest from the week before), and lovely old manor houses here and there, some of them crumbling away beyond repair, others still stately….and rough and ruddy-faced but friendly locals, village folk, farmers, tillers of the land working hard and living simply, and very happy for it. Time seemed to have stood still here. We got to our Air BnB for the night – Quinta Gaspa and were greeted outside heartily by an old man who spoke not a word of English, but as usual in these situations, you get by with smiles and gestures. The place was beautiful – an old house with wood floors, two bedrooms a spacious kitchen and living room and a lovely terrace with table and chairs overlooking the vineyards. The old man had a little port made from his own fields that he motioned us to try. It was fantastic. Eventually the man’s English-speaking daughter came to do a bit of translation. She was excited as she was going to Porto for the weekend, and typically chatty and helpful in the manner of the Portuguese. She told us she wasn’t sure if the town’s restaurant would be open that night, but there may be a bakery where we could buy some bread and a drink. It was still early, and we decided to chance it and head out away from the town to explore. We walked up the road and up through some vineyards to try to get to the chapel on the top of the hill. We didn’t make it quite that far, but we were able to get to a height which commanded sweeping views of the Douro hills and wine terraces. There wasn’t another person in sight. The only sound that of bird song. The air fresh, warm, crisp. Stunning. We got back to town as the sun was setting, and along the way we noticed parties in the garages of the large houses, where the locals were enjoying the fruits of recent labour. We found the old bakery still open in town. We bought some cheese, bread, ham, and a bottle of red wine, had a couple of pingos, then headed across the square to the tavern, Cafe Arado. A bizarre, dark little place with a pool table and farm tools adorning the walls. The barman was drunk on port, and poured us a huge glass of red wine each, which tasted fresh and earthy, and left us feeling quite light-headed. It was good stuff. We sat outside the tavern next to the old fountain, then had a short walk around the town. Quiet. Peaceful. Narrow cobbled streets. Old women in doorways chatting away, watching us curiously. Proper rural Europe. We had a lovely evening with plenty of wine and good cheer (important as it got very cold in the evening). The night was not an easy one. It was too quiet, if that can be possible, save for the hourly ringing of the town’s church bell. We are not used to silence. Morning was sunny, we had a nice breakfast on the terrace and phoned the taxi driver who had driven us here the day before. We were driven back to Pinhao, but we took our time, stopping to admire the panoramic views, and the vineyards of Taylors. Quinta Do Panascal – visitor’s centre of the famous Fonseca wines. 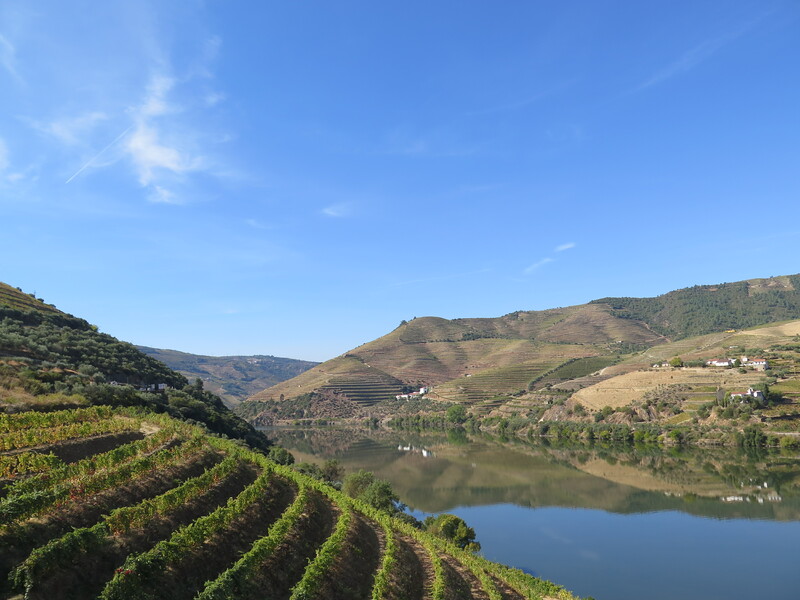 We drove into Pinhao and across the bridge to the other side of the Douro and on to Quinta Do Panascal – visitor’s centre of the famous Fonseca wines. They offer self-guided audio tours of parts of their vineyards, stunningly situated on the hills above the Tavora river. Vero and I took the 30 minute tour, interesting and informative, and it finished at the lagares, the place where harvested grapes are still trampled by foot to produce Fonseca Port wine. We sampled three Fonseca’s Ports: Siroco (extra dry white Port), BIN nº27 and Tawny 10 year old, in the lovely tasting centre – our favourite being the BIN nº27. We bought a bottle to take back to Porto. The taxi took us to Pinhao, and we had lunch in a little cafe near the river washed down with a superbock. 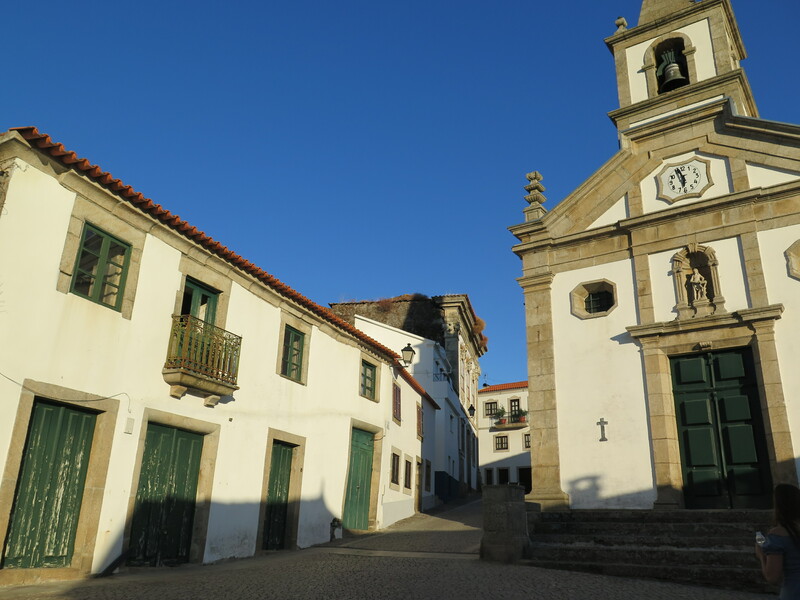 Quinta das Carvalhas….has a great range of tasting wines and ports. 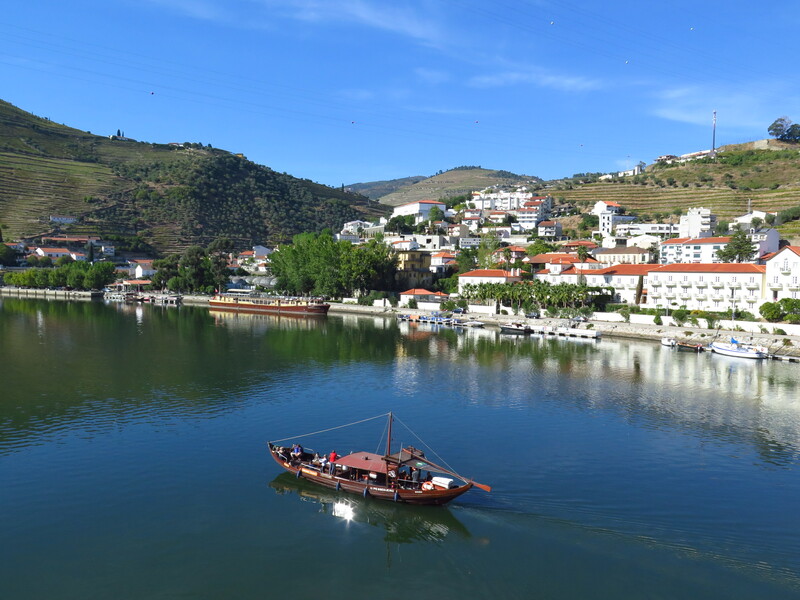 From here we walked along the picturesque river dotted with bars and cafes, and crossed the bridge to another port wine tasting place, Quinta das Carvalhas, which has a great range of tasting wines and ports. We enjoyed a rose port and a tawny overlooking the river and facing Pinhao. A boat glided past. It was lovely and warm. 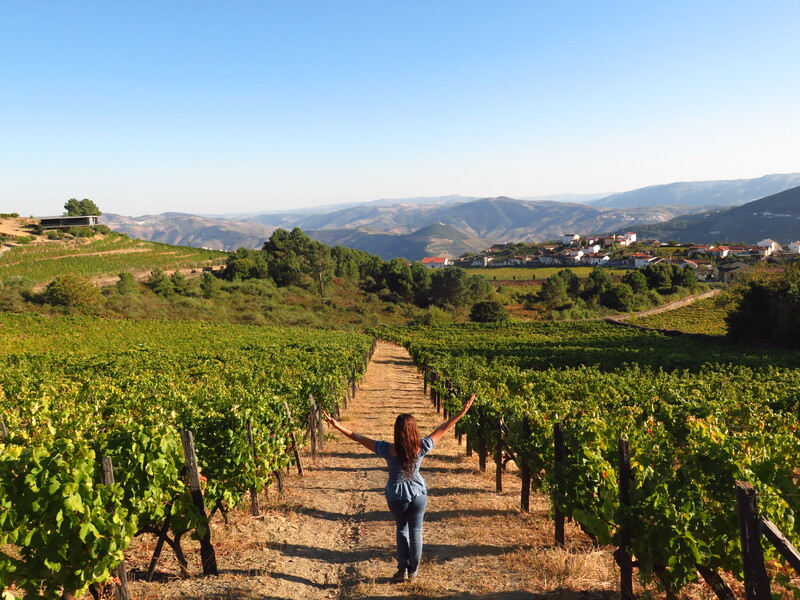 I’d found heaven on earth in the Alto Douro. We walked back across to Pinhao and grabbed a nata and another wine at the train station cafe, then hopped onto the train bound for Porto. It had been a short but memorable trip, and I imagine a monthly one for us come the summer months! ← Porto Photographs – new snaps ready!